When people panic, they tend to turn to a trusted source for advice. Like the Google search bar. Google's search team has noticed that people regularly type the phrase "I lost my phone." Instead of just returning articles with conflicting advice on what to do when your phone is stolen or hiding under the bed, Google will direct people to a new Find My Phone page. It's one a handful of features the company is adding to its My Account hub. Introduced last year, My Account is a central place for people to control privacy and security settings for their various Google accounts, like YouTube, Gmail and Google Maps. It was an attempt to make Google's settings less opaque, and to put people at ease by giving them more control over the massive amounts of data stored with Google (GOOGL). "We know that from research, users are curious or concerned about what data Google has about them," said Guemmy Kim, Google's My Account product manager. Android and Apple have long offered settings for finding lost phones, but this is the first time they're collected in one place and integrated with search results. 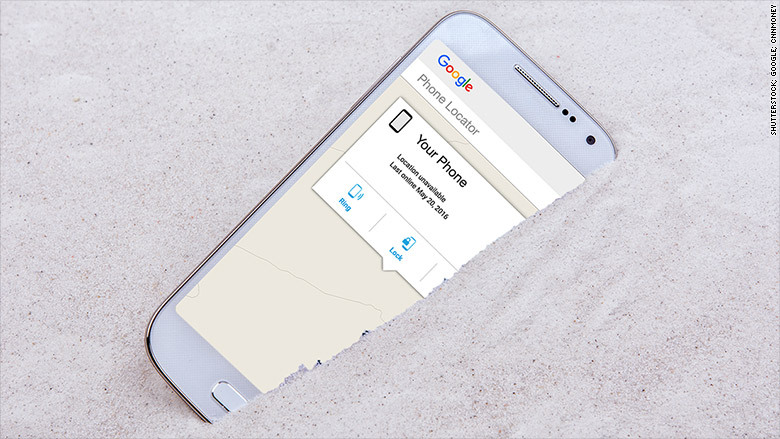 Owners of a lost mobile device can text or ring their phone or tablet, disable any Google accounts remotely, or see it on a map. For some of the options, iOS users are redirected to the iCloud page. One of the most common Google search queries is people looking up their own names. In a few weeks, the first result won't be an arrest history or Facebook page, but a link to the My Account settings. If you're not logged in, you'll still be able to see what data Google has associated with your history. More than a billion people have used the tool in the past year, but many probably still don't know that it exists. Now anyone who ever vainly Googles themselves late at night can take a moment to improve their privacy and security settings. The Find My Phone tool is available now in My Account, coming soon to your panicked search results.